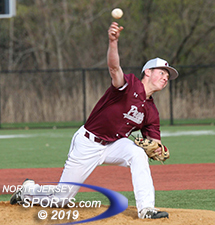 Justin O'Connor was in complete control from his first pitch in Bayonne's 4-0 win over St. Peter's Prep on Monday in Jersey City. JERSEY CITY – After a solid start fell apart in one bad inning of last season’s Hudson County Tournament final against St. Peter’s Prep, Bayonne right-hander Justin O’Connor had 10-plus months to think about what he would have done differently given another opportunity. That chance came on Monday afternoon as both O’Connor and his Bayonne teammates looked to exact a measure of revenge on their rivals. Right from the first pitch O’Connor was in complete control. The game was still scoreless until Jonathan Lee’s two-run double in the fifth broke the game open. 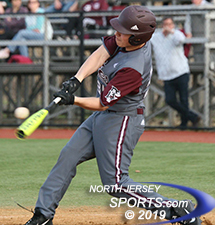 Bayonne scored all of its runs during that fifth inning as the Bees stayed undefeated with a 4-0 triumph over St. Peter’s Prep at Caven Point in Jersey City. O’Connor got ahead of almost every hitter he faced. Of all the pitches the senior had working his 12-to-6 curveball was virtually unhittable and he always seemed to throw at the right time to keep the Marauders totally off-balance. St. Peter’s Prep starter Jack Kramer did not allow a run through his first four innings. As effective as O’Connor was for the Bees, St. Peter’s Prep starter Jack Kramer was equally as effective through four innings using a similar strategy of hiding his curveball well to rip through four quick innings. With the game just 40 minutes old it was already into the fifth inning with neither team having a runner reach scoring position. The Bees switched up their approach at the plate and it paid immediate dividends. The Bees collectively crowded the plate and shortened up their swings. Starlyn Arias started things off with a single. Julian Moosh was then hit by a pitch, which set the stage for designated hitter Jonathan Lee. On a fastball on the inner half of the plate, the sweet-swinging lefty got his hands inside the baseball to rip it down the right-field line that scored both Arias and Moosh to put Bayonne in front, 2-0. A passed ball and a wild pitch allowed Lee to score. Later in the inning, Edgar Martinez line a single to center to bring home Matty Brown to cap the four-run outburst. Jonathan Lee’s two-run double broke the game open as Bayonne scored all of its runs in the fifth inning. 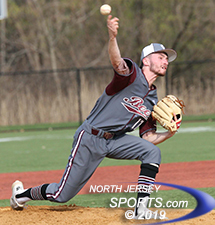 That was all the momentum O’Connor needed as he cruised through the final two innings with a strikeout to end a masterful 93-pitch effort and show the rest of Hudson County that Bayonne is indeed for real. O’Connor allowed just two hits, walked two, and had 10 Ks for Bayonne (4-0). Kyle Hess and Matteo Sollecito had the lone hits for St. Peter’s Prep (3-3). While the win is one of the biggest in recent history for Bayonne it is celebrated today and forgotten about tomorrow, especially with a showdown against undefeated Memorial on tap for Friday.